(Left to right) The Baker (James Corden), Baker’s Wife (Emily Blunt), and the Witch (Meryl Streep) in Disney’s humorous and heartfelt musical INTO THE WOODS. ©Disney Enterprises. CR: Peter Mountain. 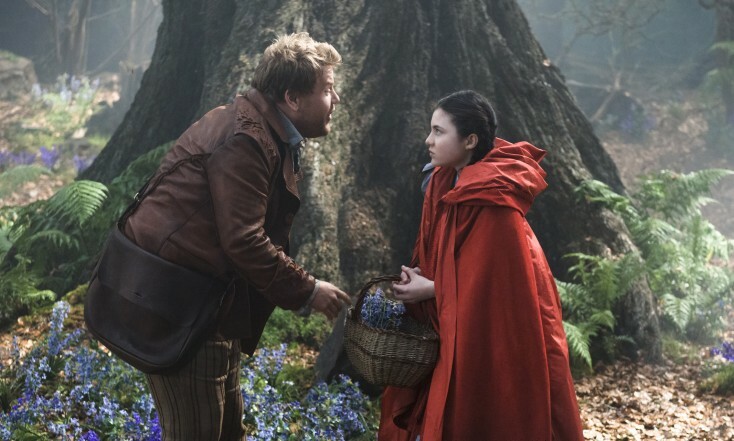 Stephen Sondheim and James Lapine’s often funny, sometimes poignant and completely enchanting Tony-winning Broadway musical “Into the Woods” arrives onscreen with a cast so good that even fans of the wonderful Joanna Gleason and Bernadette Peters 1987 stage version (available on home video) shouldn’t be disappointed. Some creator-approved omissions and other changes to the source material are unfortunate but far from fatal, and the work as a whole retains its achingly bittersweet actions-have-consequences character. At the heart of the story are a sweetly eager-to-please baker (James Corden) and his yearningly baby-craving wife (Emily Blunt). An imperious and impatient witch (Meryl Streep) tells them they must gather four items from the woods to break the curse that has kept them childless. The complications of that quest cause the plot to take a “be careful what you wish for” turn midway through that turns the concept of happily-ever-after on its head. Streep and Blunt triumph at the difficult task of redefining roles already played to perfection by the brassily hammy Peters and the enjoyably ironic Gleason (who won a Supporting Actress Tony for her performance). Appropriately, both do so by softening their characters’ edges just enough to make them seem more convincingly genuine and less flamboyantly stagey. The wild-eyed witch still can raise a whirlwind, but her motherly moments here with the daughter she knows she’s losing are heartbreakingly moving. The unstoppably determined baker’s wife has a touch more melancholy wistfulness onscreen than onstage, which gives her sassiness an irresistible sweetness. The delightful paradox of Rob Marshall’s direction is that he somehow makes the entire production seem more intimate than the stage version, despite the movie’s more realistic and extravagant settings and special effects. While the Broadway version sometimes lent itself to a more than winking acknowledgement of the audience, the film keeps more focus on the fantasy. Helping to prevent massive spectacles from overshadowing the players, scenes such as Jack’s above-the-clouds encounters with giants and the Royal Ball that Cinderella attends are still allowed to take place entirely offscreen. Sondheim’s elaborately crafted lyrics are so well written and intricately constructed that listening to them can be positively intoxicating. The out of control alliteration of Cinderella’s “On the Steps of the Palace,” the ingeniously complex finger-pointing interplay of “Your Fault” and the melodramatic madness of two princes manfully proclaiming their lovelorn “Agony” are energetic highlights. Johnny Depp’s zoot-suited Big Bad Wolf gives the hungrily lusty “Hello, Little Girl” an oily, amusing yet menacing carnality. At the other end of the spectrum, the devastating “Witch’s Lament,” “Finale/Children Will Listen” and “No One Is Alone” manage to be tearfully moving without seeming mawkish. Among the notable things missing from the movie are early appearances by a mysterious old man whose unexpected identity is revealed in the play’s second act, and a wised-up “Agony” reprise by the then paired-off princes whose hearts still harbor desires even after they have won their true loves. Rapunzel’s fate is altered, and she is not seen nearly as much in the film as in the stage version, to the point where her character eventually seems to have been forgotten. A new song written by Sondheim for the witch reportedly was shot but cut from the final version of the film. As the characters in this marvelous musical learn, however, there’s something to be said for appreciating the things one has instead of wishing for more. While Pine’s rakish prince declares at one point that he was “raised to be charming, not sincere,” “Into the Woods” manages to be both. Even in somewhat abridged and slightly altered form, this is one of the most entertaining and thoroughly satisfying movies of the year.